Soil tests are the best way of getting an x-ray view into the composition of soil. In most areas of the U.S., soil quality varies greatly from house to house and even within the same yard. A worst case scenario may be when home builders remove the topsoil and do the finish grading with the subsurface clay. The homeowner is then expected to grow quality turfgrass in what the contractor calls soil. I would think that most situations are a little better than that, but if not, all things are fixable. Soil tests are designed to measure the nutrients that are available to plants and recommend corrective action for any problems. Before buying the first bag of fertilizer, submitting a soil sample to be tested will provide helpful information and insights into establishing lawn fertility goals. Since different grasses require differing amounts of nutrients, professional soil tests will base the results on the primary grass type you have. Depending on the lab, they may check for soil pH, buffer pH, CEC (cation exchange capacity), and percent of organic matter. They will also measure some or all of the following nutrients, such as phosphorus, potassium, copper, iron, Manganese, zinc, boron and a few other tests. Some labs do not measure Nitrogen (N) levels because of how mobile N is in the soil. The level of nitrogen fluctuates greatly and the results may not be accurate by the time a fertility program is initiated. It should be noted that the soil testing labs print the results using turf industry terminology, often without any explanation as to what they mean. If a person is not familiar with soil science, parts of it may seem like Greek. Home test kits are available at lawn and garden stores and are labeled as a soil pH test kit or simply as a home soil test kit. The soil pH test kit may only test the pH level of your soil or it may check nutrient levels as well. Make sure it is capable of performing all you need it to do. These test kits are easy to use are okay as long as you are only looking for a ballpark figure. If you are not experiencing any serious problems with your lawn, the home kits may be fine. You can also reuse these test kits if multiple samples need to be tested. They do have a number of limitations, however. For example, it will give you a fairly accurate soil pH, but not the buffer pH, which could make a lot of difference if lime or sulfur is needed. The buffer pH is an analysis of the soil pH as it relates to the type and characteristics of the soil you have. In some cases where lime is needed, the buffer analysis could actually double the amount of lime required to bring the soil back to proper levels. Professional labs have the equipment needed to perform routine and specialized tests. If the test records a deficiency in some area, the computer will provide a solution to bring it into compliance. The tests can be submitted through your local university extension office for a small fee. They will usually supply you with the soil sample box and digging equipment, if needed. The drawback to using a lab is that someone may need to explain the results further. Labs tend to use turf industry terminology without any explanation as to what the terms mean. One caution: Make sure the lab has plenty of experience in turfgrass soil testing. Labs that specialize in agricultural soil testing often over estimate the nutrient needs of lawn grasses. Turfgrass is more efficient at removing nutrients from the soil than are field crops, so less nutrients are needed. How to properly take a soil sample? On the day you take the sample, make sure the soil is not too wet from any previous rain or recent heavy watering. It is best to do the sample when you have not recently fertilized. Start with a clean bucket. If the bucket was used for other outdoor use, make sure it is washed thoroughly and dried before use. If it is not cleaned properly, anything that was in the bucket could register in the test. Use a shovel, auger drill or any clean tool to dig a small hole 3 to 6 inches deep. If you are using a shovel, once the hole is dug, take a 1 inch slice along the side of the hole from top to bottom. That 1 inch slice is the sample you will use. After collecting the sample, place it into the bucket. If you are using a corer or auger, collect soil from the entire depth of the hole and place it in the bucket. Second, take samples from different parts of the yard. For the average sized front yard, take at least 6 samples, in a zigzag pattern. Take several samples from both the sides of the house and the back yard as well. You may have a quart or more of dirt when it is all done. Place the bucket aside in a protected and dry location and let the soil dry overnight. The next day, mix the soil thoroughly in the bucket and remove the amount the lab requires for the test. Place the sample in the container approved for the test and mail it as directed or return it to the extension office. This method of mixing the soil will provide an “average” and the same amount of fertilizer or corrections will be done uniformly over the yard. If you are concerned about a specific area of the yard where the soil quality may be quite different from other parts, you can test that area separately. It may cost a little more if you are using a lab, but you will get more accurate results. 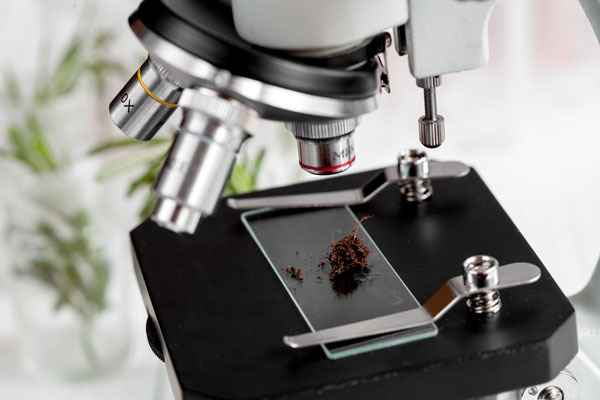 How often should soil tests be done? If the soil was in need of correction, such as liming, then testing once a year may be in order to monitor the progress. If the report indicated that only slight correction was needed, then once every two or three years should be fine. Understanding the soil analysis report can be difficult. Click here for an explanation of results commonly found in most reports. Go from the Soil Tests page back to the Fertilization page. An introduction to fertilizers and fertilization geared for home lawns.